"The Sacred Art of Ancient Japan"
September I was in London for ECTS, Europe's largest video game trade show. 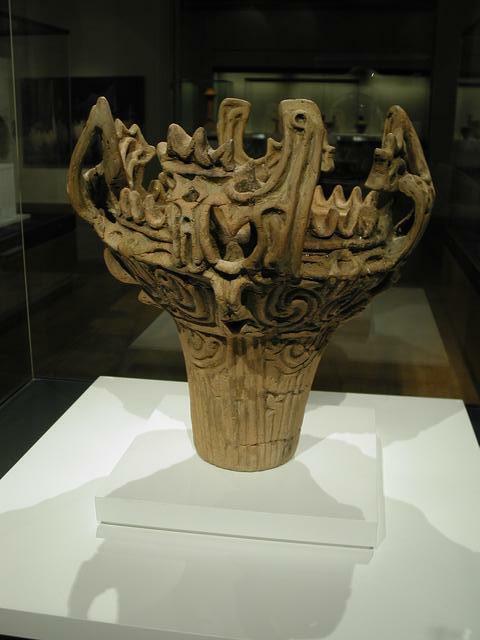 It turned out to be the opening of the British Museum's exhibit on Shinto art and artifacts. The day my plane left, I went there early - I was the first patron to the exhibit. The exhibition occupied the museum's Japan wing. 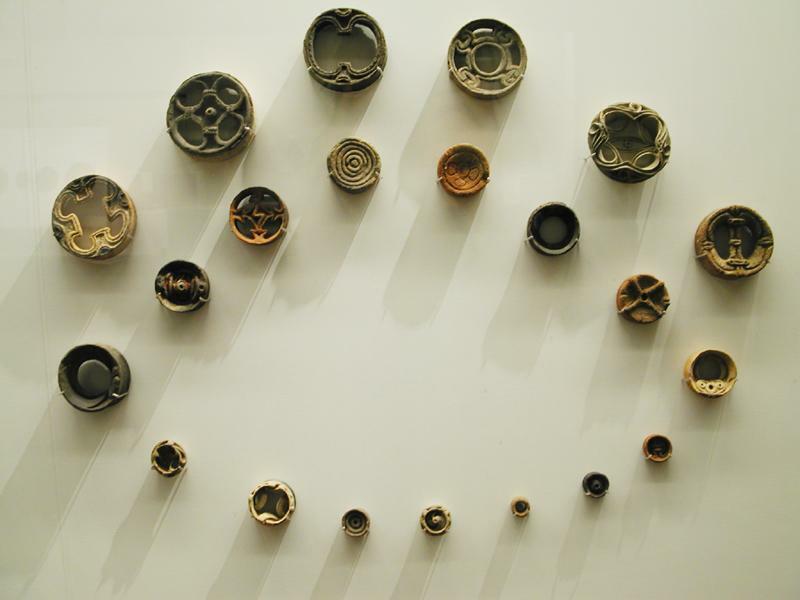 Spacious layouts and soft lighting; a select few pieces sat with long text descriptions describing the ceremonial role of objects in Shinto practice. 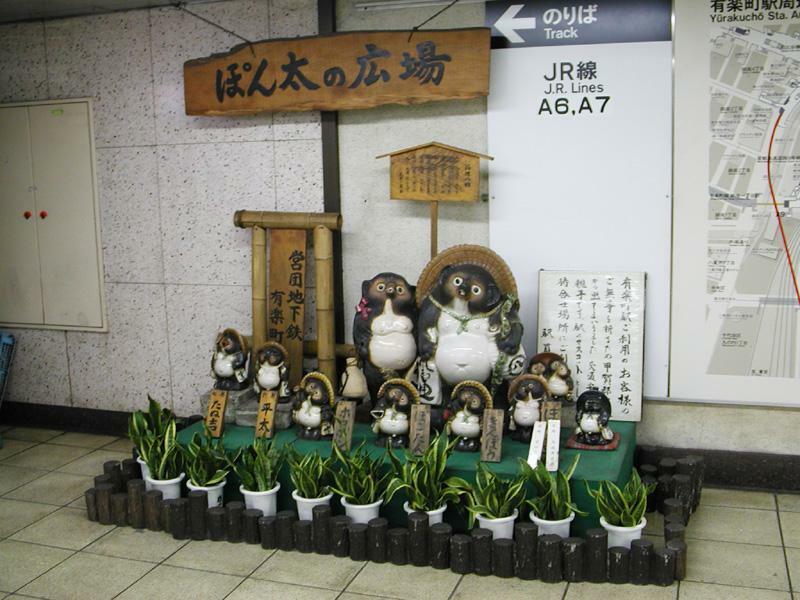 Purposefully dignified and meditative, I suppose; not the sort of animated bestiary characteristic of many of the functioning Shinto shrines in Japan. Upstairs past the entrance, there were swords and statues, a few masks, mostly pieces dating well after the Battle of Hastings. Here much of the exhibit concerned the merging of Buddhism and Shinto. I was interested more in the aged animist tradition; fortunately the roots of Shinto were more in evidence downstairs. 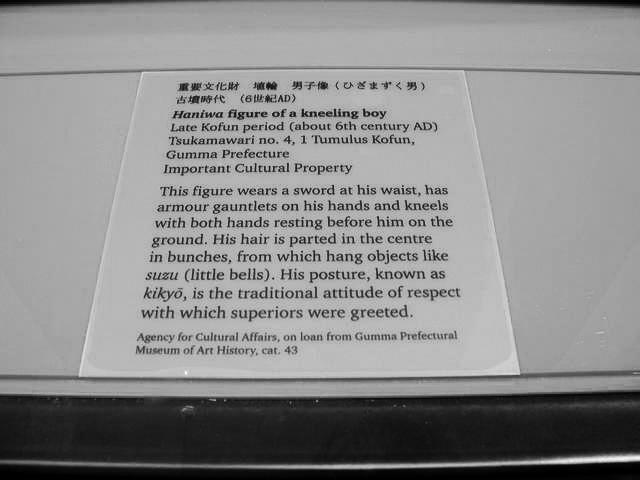 Being early, I was able to spend quality time with these Japanese religious artifacts, some pre-dating Rome and Christ. These were stimulating pieces. 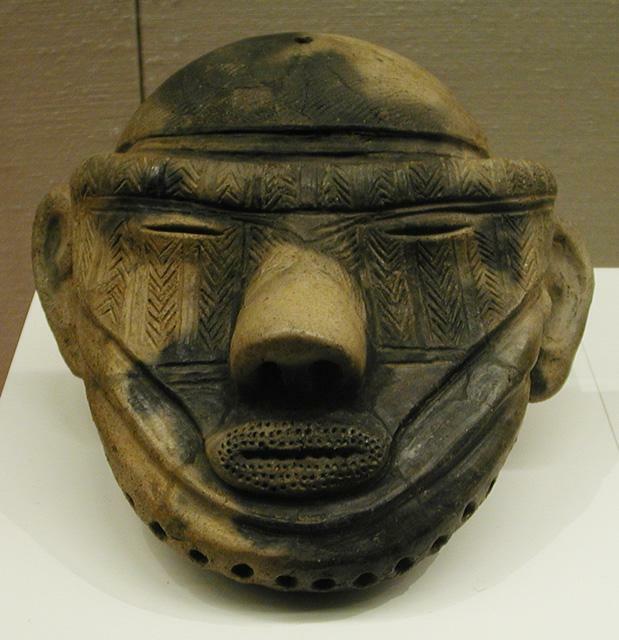 Some objects had the same functions as most "primitive" crafts the world over - every old culture had drums, and jewelry, and cookware, and death masks. 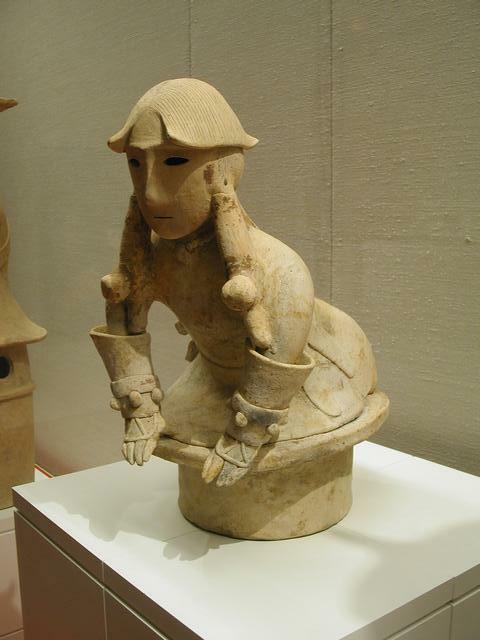 But to distinguish these pieces, there was some unusual and unsettling design. 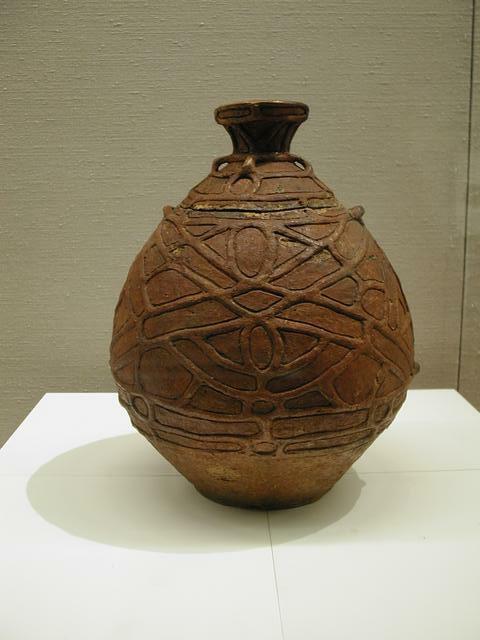 The lines on this pot are breathtaking - dense, varied, non-linear. Supposedly, it's a cooking vessel, which is fitting perhaps since it looks like noodles on the outside. But it would have been difficult to clean! 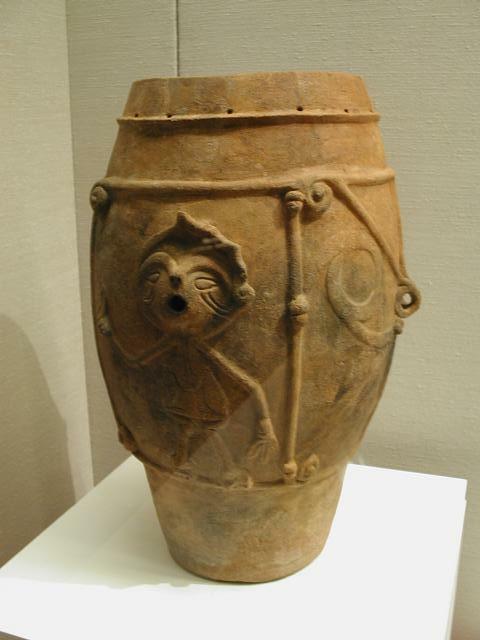 This is a ceramic drum. You can see the holes around the top where you might tie down a membrane. 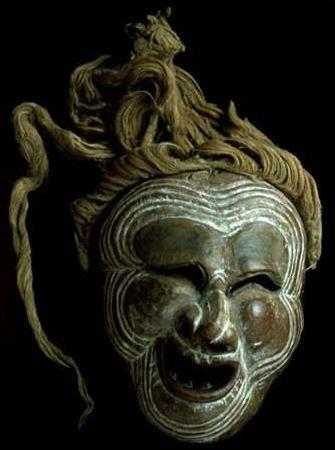 This is a mask with a neatly distorted perspective. This nose was inspiring. Noses, mouths, and ears. 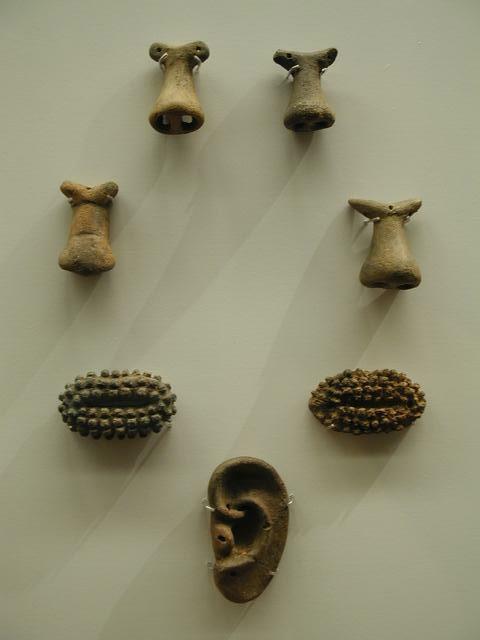 These were some clay body parts that appeared to be accessories for an unknown larger body. Perhaps people wore them? Swelling symmetrical lines on this pot. 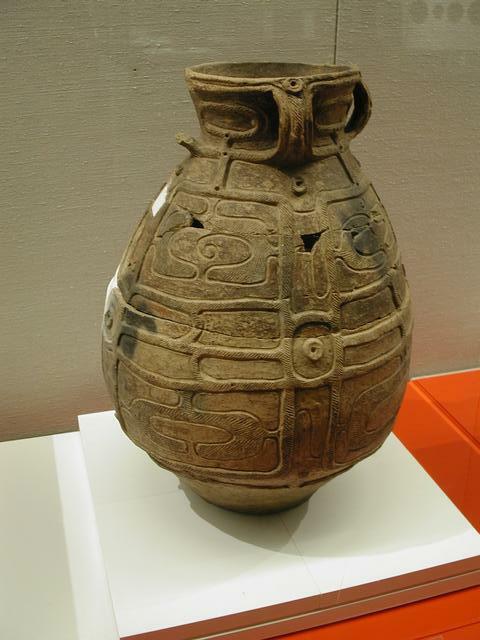 This is a large vessel that was intended to hold a person's dried bones, some innards, and a few personal effects. It's sliced open around the middle - to put stuff in, or take stuff out? 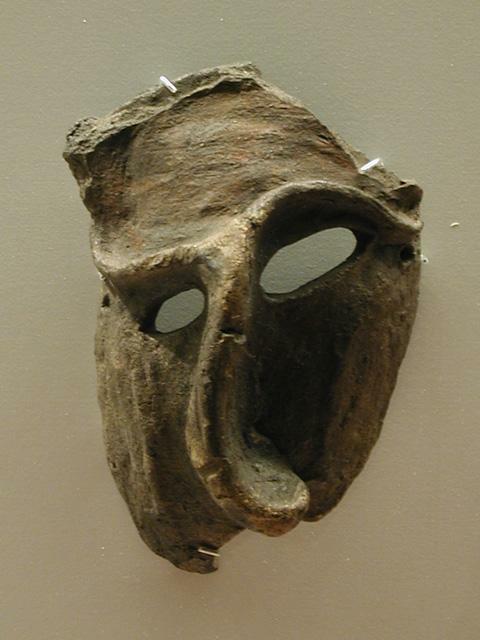 This is a mask, a visage after death. Somehow nearly African looking? Dense patterning around the eyes. These are some old ceramic earrings. They must have been heavy - these ladies or men probably had some stretched-out earlobes. Maybe that was the style back then. I loved these small circular patterns. 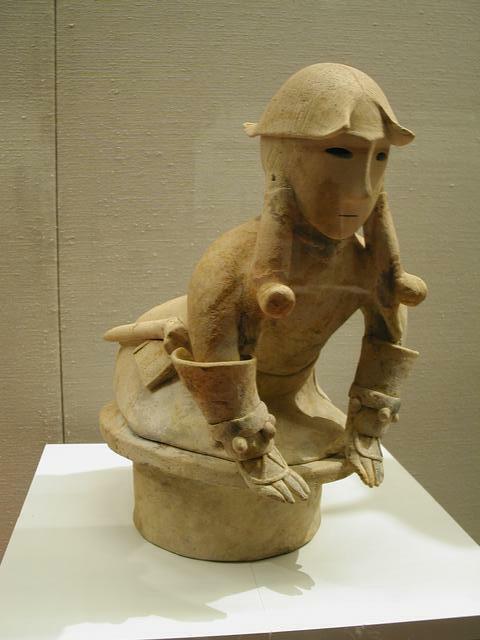 The most provocative piece in this exhibit was a Kneeling Boy - a pottery Haniwa doll figure. The craftsmanship was not ostentatious, but superb, essential. The posture, and the gesture were exceedingly evocative. Lifelike, but more than lifelike. Epitomizing something. Flat hair, simplified form - elegant. The face, with open, hollow eyes and a straight mouth, it was arresting. 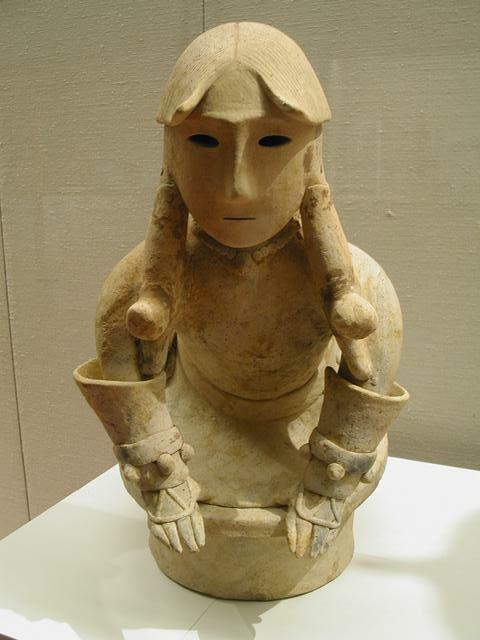 You can see echoes of this distillation of a young form throughout much Japanese art. 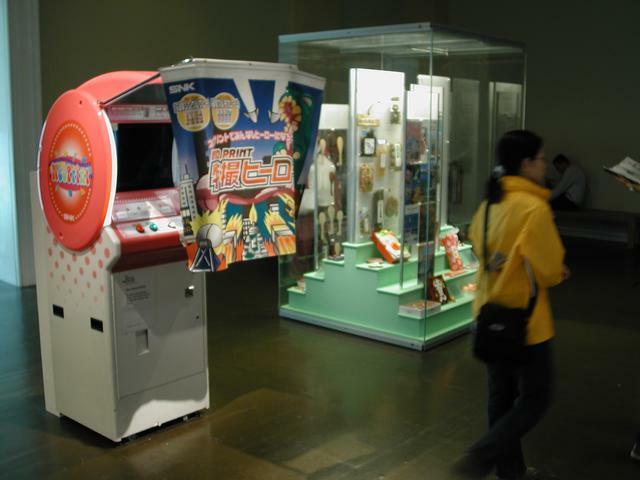 Wandering back through the museum, there was a small exhibit of contemporary Japanese souvenirs (omiyage), as a part of a series of British Petroleum exhibits on global culture. So here I had just come from staring at thousand year old clay pots, and I was presented with a NeoPrint machine and plastic sushi in the middle of the British Museum. 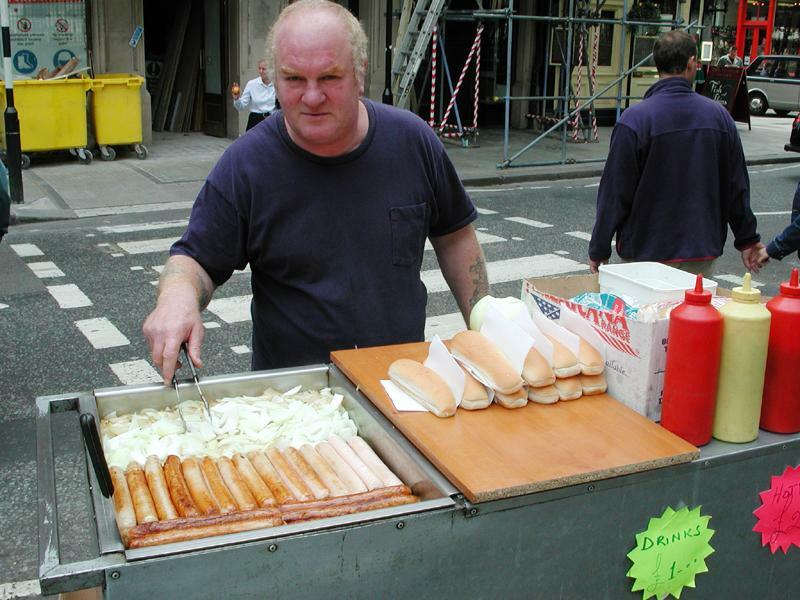 This man was selling bangers (?) outside of the British Museum. Initially reluctant, this sausage selling man agreed to pose for a photo after he heard that I was from San Francisco, and I was posting a series of photos of hot dog vendors to the internet. The first picture was of Muhammed in New York back in May; this is the second in the series. Didn't get this chap's name. No flash was used to take pictures of these artifacts. I didn't have access to that book when I wrote this.